Alice’s Garden needs volunteers! 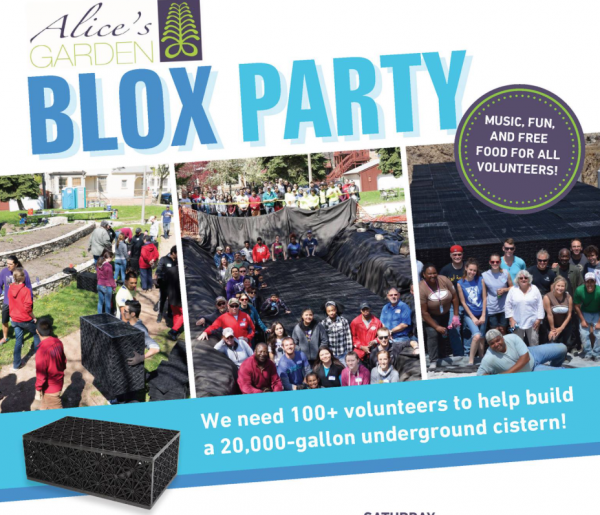 Help us install a 20,000-gallon underground cistern that will collect rainwater to irrigate Alice’s Garden. The cistern will help manage storm water and reduce flooding in the neighborhood! You are invited to join Lake Park Confirmation and High School Youth in volunteering! Elementary age children (accompanied by an adult) up to adults are welcome to volunteer. The service event will run from 10am-3pm (come and go as you’re able) at Alice’s Garden, 2136 N. 21st St in Milwaukee. Registration is very important! Please sign up here, or email office@lakeparklutheran.com with the number of volunteers you will be bringing! ← Fall Kickoff & Block Party!